Now in its fifth year, Radius Components Ltd. has rapidly established itself as the first port of call for the commercial vehicle aftermarket parts sector. The constantly expanding and evolving business continues to grow organically and exponentially on the back of providing outstanding products and customer service. We touched base with founder / proprietor Christy Deegan to get an update. 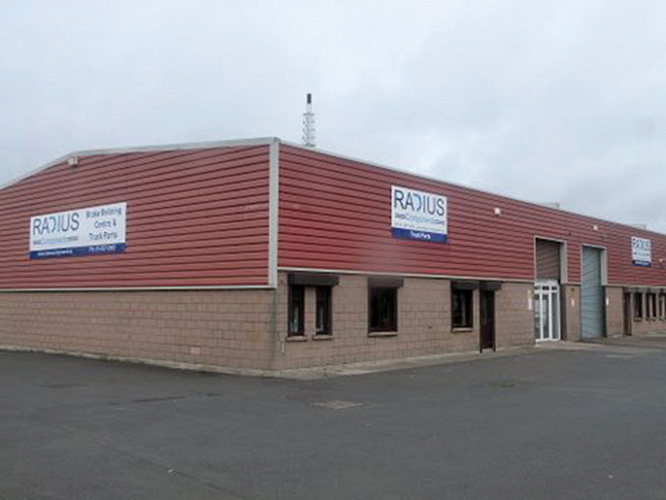 Currently in the process of revamping their premises in Clondalkin Industrial Estate, Radius Components Ltd. is going through a phase of rejuvenation in response to rapid expansion. The site has been given a substantial overhaul, the impressive fleet of company vans has been refreshed, and the already-excellent range of products and unrivalled service levels are getting even better. In short, the business is going from strength to strength. Having established the progressive company in conjunction with his wife Breda on March 1st 2013, Christy was delighted when Dave McNamara joined soon after, collating over 50 years experience and innate understanding of the commercial vehicle aftersales market. They have enjoyed tremendous success to date and are now preparing to take Radius Components to the next level. The remarkable success recorded over the past four-and-a-half years has been due to outstanding customer care, great products and excellent service. By improving these even further, offering an even bigger selection of parts in a more streamlined, efficient and cost-effective manner, tailored to the exact needs of vehicle owners and operators, it logically follows that the business should continue to thrive and expand. Since day one Radius Components Ltd. have been completely customer-orientated, offering bespoke services to meet the precise requirements of each individual vehicle / owner. Knowledgeable, experienced, friendly and motivated personnel are on hand to provide one-on-one care with unwavering attention to detail, all from a central, convenient location in Dublin 22 which has just been given a major facelift. All in all, it’s easy to see why Radius Components is the happening place right now in the commercial vehicle aftersales industry! “We’ve have expanded our unit and are now occupying in excess of 6,000 square feet, with seven staff and three vans on the road,”Christy confirms. “We have a brand-new, state-of-the-art warehousing facility and sales office and we’ve also taken a lot of new suppliers on board.”Considering that it started out from the humblest of beginnings, this impressive business has come a long way in a comparatively short space of time. “We’ve grown organically and will continue to do so going forward,”the managing director confirms. A comprehensive, exhaustive range of components for commercial vehicles is stocked, from brake pads, brake discs, brake chambers, brake drums and brake linings to clutch kits, wheel bearings and flywheels, slack adjusters, steering and suspension components, clutch callipers, air springs, etc., etc. The professional team at Radius Components ensures that the most suitable part is always available and supplied in the quickest possible timeframe, with a courier service available if required. Meanwhile, brake relining / bonding can be carried out on-site by a team of qualified technicians (trained in accordance with manufacturers guidelines) manning a purpose-built, fully-authorised workshop, with quality brake linings in stock from leading manufacturers to suit all types of vehicle –truck, trailer, bus, crane, etc. “We’ve effectively transformed the business into a fully-fledged general commercial vehicle motor factors,”says Christy. “We carry all the leading brands, including LuK [who supply systems and components for vehicle powertrains], Ferodo [the premium braking brand for pads, discs, shoes, linings and accessories], Lumag [brake pads and brake linings for commercial vehicles] and Neotec [air springs]. Radius Components Ltd. sells commercial vehicle aftermarket products to customers –from garages to owner-drivers to large fleet operators –with up to 90% of trade currently taking place within the greater Dublin area. On the back of exceptional service, the company’s reputation has spread quickly and they find themselves in a strong position, albeit within an extremely competitive and volatile market. The passion and dedication of the directors and other team members at Radius Components permeates every facet of the operation and these qualities have been instrumental in the success of the business to date. Regarding the key to the company’s popularity in the haulage and distribution sector, Christy states: “We deliver a bespoke service to each and every client. We go the extra mile and treat everyone the same. Each customer is different and their needs are different and you have to sort them out. Further growth will surely follow. This is a relatively new success story, one with many more chapters yet to be written.